Begin your day with a sightseeing tour of the Island, which will provide a good overview of all the sights and history of the Vineyard, including a stop at the clay cliffs in Aquinnah, ancestral home of the Wampanoag Tribe. The Gay Head Cliffs are designated a National Natural Landmark be the U.S. Department of Interior in recognition of the biological and geological significance to the nation. After the tour, visit the whimsical gingerbread cottages in Oak Bluffs, originally the site of Methodists summer revival meetings. Then explore the many unique shops and art galleries in and around Circuit Avenue and The Arts District. Take a stroll over to Ocean Park for a view of period homes, the gazebo and stunning vistas before you hope the VTA’s #13 bus towards Edgartown. Looking to see the Island in one day using public transportation? The islands bus system, the Vineyard Transit Authority has you covered! See their suggestion of the best way to see it all here. Once in Edgartown, stroll down Main Street, passing the Dr. Daniel Fischer House and the Old Whaling Church, a stately landmark built by whaling captains in 1843 and considered to be one of the finest examples of Greek revival architecture in New England. Continue down Main Street towards the harbor and enjoy one-of-a-kind shopping, cafes and galleries in the square of Main Street- North Water Street and harbor area- to Winter Street and back down North Summer Street. Venture beyond the retail district to experience homes built by whaling captains surrounded by lovely gardens and beautiful views of the harbor. And don’t miss a climb into the Edgartown lighthouse for breathtaking views! Mytoi ("me'-toi") is a small Japanese-style garden set within an open pine forest. The garden's signature feature is a small pond with an island that is reached by walking over an arched bridge. Winding footpaths take visitors through a birch walk, camellia dell, stone garden, and hillside garden. A rustic shelter offers broad views of the garden and a chance to become immersed in the meditative qualities of the landscape. 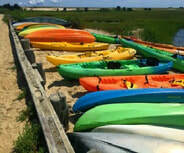 Kayak, birding, and walking tours are available daily. 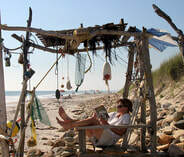 Up-Island Nightlife - Head out to the picturesque fishing village of Menemsha , grab a picnic at any one of the rustic, but amazingly fresh seafood markets, and take in the magical nightlife of the sunset over the Atlantic. Tel. 508.693.8714 Tour Season: May through October, 90 minutes Learn about the people, places and events in the evolution of the African American presence on Martha’s Vineyard from the early 1700s to the present through this guided tour of 12 historical sites. Tel.508.693.4361 The African-American Heritage Trail is a series of 19 sites that include the home of William Martin, the Island’s only African-American whaling captain, the Seaport of Menemsha, the Gospel Tabernacle, and the home of Dorothy West. This is a self-guided trail. Martha’s Vineyard has always been a farming community and today celebrates its roots with sustainable small farms that dot the Island. Local farmers provide abundant produce, dairy, poultry and fiber that are used by home and five-star chefs. 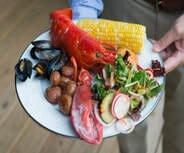 Combined with the bounty of fresh fish and shellfish, you know you’re always eating fresh, locally produced food when you’re on Martha’s Vineyard! Many of our small farms welcome families and offer programs and events year-round that are great for kids and adults. The Farm Institute and Native Earth Teaching Farm are wonderful places to send half a day with kids, and Island Alpaca Farm will have the entire family in love with these friendly critters! Many farms have small roadside stands to purchase produce, eggs, flowers and honey on the honor system. The Farmers Markets are also a wonderful place to visit while you’re on the Island, not only for fresh local food, but music, crafts and family fun! 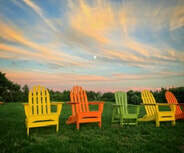 The depth and diversity of the arts on the Vineyard will delight everyone! The Vineyard Haven Harbor Cultural District in Tisbury, named a 2013 Small Town Arts Place begins at Martha’s Vineyard Film Center at the Tisbury Marketplace, and extends past a wonderfully diverse and dense area that includes wooden shipbuilders, interior design, architects, galleries and studios, all the way to the Vineyard Playhouse. A detour up State Road quickly brings you to the reknown Tuck and Holand an open studio for weathervanes and metal sculpture. 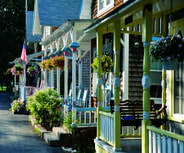 The delightfully eclectic Arts District in Oak Bluffs features arts, jewelry, clothing, crafts, and photography galleries. While you’re in the neighborhood, stroll through the Campgrounds with its beautiful gingerbread cottages. Don’t forget to pay a visit to Featherstone Center for the Arts, a year-round community arts and learning center with programs for artists of all ages. Edgartown’s historic architecture and intrinsic charm will dazzle art lovers. No visit to Edgartown is complete without a visit to the fabulous Martha’s Vineyard Museum, located just a short walk off Main Street on School Street. You'll know it by the historic Fresnel lens sited on its lawn, a memory of the beacon that once beckoned seamen across the Vineyard Sound. 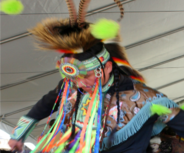 Inside, vibrant exhibits celebrate our Island's history and culture while informing our future. 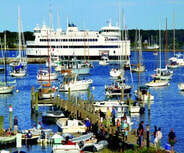 Edgartown boasts a wonderful mix of design and arts in its galleries and shops. 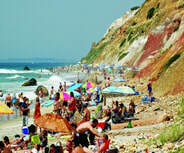 No arts tour is complete without a trip to the up-Island communities of West Tisbury, Chilmark and Aquinnah. Small antique shops, farms and galleries dot the landscape, with must-stops at the open studio of the Martha’s Vineyard Glassworks,the Granary Gallery , the whimsical outdoor sculpture gallery at the Field Gallery, and a treat from historic Alley’s General Store. At the Gay Head lighthouse in Aquinnah visitors will delight not only in the stunning views, but also at the shops filled with Wampanoag handcrafts, as well as the Aquinnah Cultural Center. 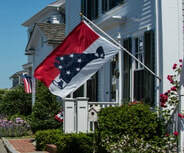 The three port towns of Vineyard Haven, Oak Bluffs and Edgartown all have historic districts with walking tours available that include maritime, cultural, architectural and Native American elements. The Martha’s Vineyard Museum is a must-see for all history buffs, complete with an original Fresnel lens on the lawn, and wonderful exhibitions inside. Five historic lighthouses dot our landscape, including the Cape Poge lighthouse on Chappaquiddick, the Edgartown lighthouse on Edgartown Harbor, East Chop lighthouse in Oak Bluffs, West Chop lighthouse in Tisbury, and the distinctive red brick Gay Head lighthouse in Aquinnah. All but the West Chop lighthouse are open to the public Memorial Day to Labor Day. Please check at the Martha’s Vineyard Museum website for additional information about sunset views, events and festivities at the lighthouses. A wonderful, family friendly tour of the remote Cape Poge lighthouse on Chappaquiddick, including the stunning Mytoi gardens, is available daily in season, contact the Trustees of the Reservation for schedules and fares.